Reading and share top 16 famous quotes and sayings about Bush Iraq by famous authors and people. 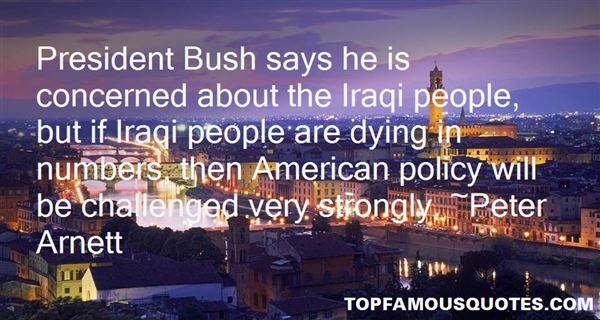 Browse top 16 famous quotes and sayings about Bush Iraq by most favorite authors. 1. "Genius, scholar, and war hero though he is, you have to admit - or maybe you should think about admitting - that George Bush might have rushed things a little in invading Iraq." 2. "George W. Bush and Tony Blair had to convince the world that Saddam Hussein represented an imminent threat. Tony Blair lied when he claimed that Iraq could launch a chemical or biological attack within 45 minutes." 3. "Most people, when directly confronted by evidence that they are wrong, do not change their point of view or course of action but justify it even more tenaciously. Even irrefutable evidence is rarely enough to pierce the mental armor of self-justification. When we began working on this book, the poster boy for "tenacious clinging to a discredited belief" was George W. Bush. Bush was wrong in his claim that Saddam Hussein had weapons of mass destruction, he was wrong in claiming that Saddam was linked with Al Qaeda, he was wrong in predicting that Iraqis would be dancing joyfully in the streets to receive the American soldiers, he was wrong in predicting that the conflict would be over quickly, he was wrong in his gross underestimate of the financial cost of the war, and he was most famously wrong in his photo-op speech six weeks after the invasion began, when he announced (under a banner reading MISSION ACCOMPLISHED) that "major combat operations in Iraq have ended." 4. "In 1933, it was in Franklin Roosevelt's political interest to tell Americans the greatest danger was "fear itself." Seventy years later, it was in George W. Bush's political interest to do the opposite: The White House got the support it needed for invading Iraq by stoking public fears of terrorism and connecting those fears to Iraq." 5. 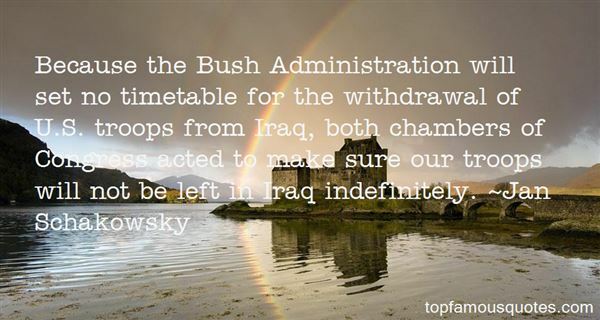 "Bush does not want to go down in history as the president who lost in Iraq. His strategy to the extent he has one is to hang tough and let whoever succeeds him take the fall." 6. "According to Richard Clarke, the former White House counterterrorism chief, Bush was so obsessed with Iraq that he failed to take action against Osama Bin Laden despite repeated warnings from his intelligence experts." 7. 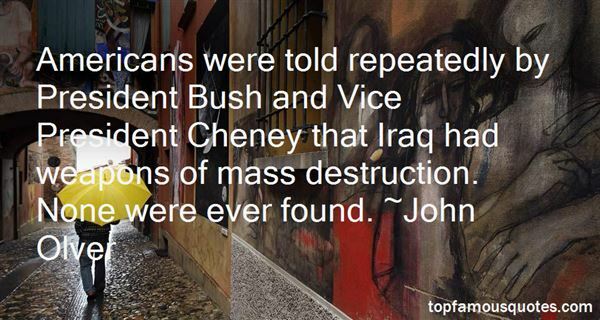 "Bush's war in Iraq has done untold damage to the United States. It has impaired our military power and undermined the morale of our armed forces. Our troops were trained to project overwhelming power. They were not trained for occupation duties." 8. "If we are lucky, and George W. Bush is right, we are about to witness the War of the Happy Iraqis." 9. "Because the Bush Administration will set no timetable for the withdrawal of U.S. troops from Iraq, both chambers of Congress acted to make sure our troops will not be left in Iraq indefinitely." 10. "Americans were told repeatedly by President Bush and Vice President Cheney that Iraq had weapons of mass destruction. None were ever found." 11. "So a truthful assessment of how America is doing in the war on terror as a result of President Bush's war on Iraq is that we have been set back by decades." 12. "Barack Obama's life was so much simpler in 2009. Back then, he had refined the cold act of blaming others for the bad economy into an art form. Deficits? Blame Bush's tax cuts. Spending? Blame the wars in Iraq and Afghanistan. No business investment? Blame Wall Street." 13. "I argued that the Bush administration, and the Coalition officials more recently, didn't understand Iraqi society. They thought it was a blank slate, that they could use Iraqis as guinea pigs." 14. "George W. Bush was a very bad president. The Iraq war was a big mistake. The U.S.A. needed a political change. I hoped Barack Obama could be a good president, but I'm disappointed. He hasn't done well." 15. "President Bush says he is concerned about the Iraqi people, but if Iraqi people are dying in numbers, then American policy will be challenged very strongly." 16. "I think the Bush Administration had basically inherited a policy toward Iraq from the Reagan/Bush Administration that saw Iraq as a kind of fire wall against Iranian fundamentalism. And as it developed over the 1980s, it became a real political run-a-muck... even though the Iraqis were known to be harboring Palestinian terrorists." I have given up trying to be happy. It is no use an leads to nothing."